Did you know that the Boston Terrier is one of only a handful of dog breeds that were actually developed in the United States? It's true. Come learn a bit more about this wonderful companion breed. The dapper little dog we know today as the Boston Terrier is quite a different dog from the one Robert Hooper first brought to his home in Boston and used to found the breed. This Boston Terrier original traces its origin to a cross-breeding between an English Bulldog and the now extinct White English Terrier. Along the way, Bostons were further cross-bred with other breeds such as French Bulldogs and even the mighty English Mastiff in order to bring new blood into what had become a very small gene pool. Eventually breeding programs concentrated on Boston-to-Boston mating, resulting in the breed we know today. 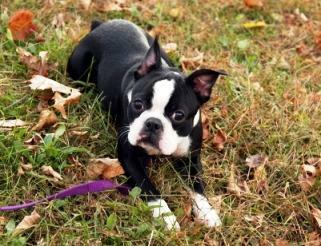 While early specimens weighed as much as forty pounds, today's average size Boston Terrier weighs only 15-18 pounds. The Boston Terrier is a muscular, energetic little companion dog, easily recognized by its distinctive markings. Although the breed comes in brindle and white, seal and white, and black and white, it is the black and white combination of short, smooth, tuxedo coat that gives the breed its "gentlemanly" appearance, no slight to the females intended. The white area of the coat extends from the center of the forehead and proceeds down the muzzle, chest, and front legs. It continues around the neck and to varying degrees across the shoulders and belly, finally running down a portion of the rear legs. The remainder of the dog is either brindle or one of the solid colors mentioned. Boston Terriers can be a bit on the feisty side, owing to some of their fighting dog and terrier ancestry, but these dogs do make wonderful companions when properly trained and socialized. They are very affectionate and devoted to their owners, and enjoy a lively game of tug as well as a good cuddle. Bostons are very intelligent and are capable of easily learning whatever you care to teach them, if you are consistent. These little dogs do tend to have minds of their own. So, if you are lax in providing guidance, they will definitely choose their own route in life. That said, a well trained Boston is a joy to know. Like many other brachycephalic breeds with round heads and pushed in faces, Bostons are prone to snoring and snorting spells. This can be caused by an elongated palate, narrow nostrils, or a combination of the two that results in rather small airways, which also make this breed more prone to heat stress. Boston Terriers can be great companions and family pets. Their small size is perfect for cuddling, but their sturdy build is more durable than the average Toy breed. If you're looking for a pet that is intelligent, affectionate, and ready for fun, perhaps it's time you considered a Boston?